What oh what can I do with rhubarb that doesn't require a cup and a half of sugar? This has been my conundrum as I've started reducing added sugars from my diet. I absolutely love rhubarb but don't like that most recipes call for a serious amount of sugar to cut the tartness of the rhubarb. And it is definitely true that you need to pair rhubarb with something sweet to make it palatable, but it does not need to be drowning in sweet. In fact, bitter and sour/tart are important flavors that don't get nearly enough credit in our sweet-crazed society. There are very few bitter flavors we accept in our diets- coffee and chocolate being a few of the exceptions, and these are often overpowered by sweet. Sour (or tart) is definitely more common - lemons, green apples, grapefruit, sauerkraut - but enjoyed much less often than sweet or savory. Rhubarb definitely falls into the sour/tart category, and I wanted to find a way to prepare it that was more true to its tart flavor, while providing just enough sweetness to balance it out. This is a quick and easy recipe, and I find it entirely delicious. It is a more tart way to prepare rhubarb - so don't expect it to be too sweet! Chop the rhubarb stalks into bite sized pieces. Juice the orange using a citrus juicer or by simply squeezing the juice out into a bowl. You need about 1/2 cup of juice. Add the rhubarb and orange juice to a sauce pan and cook at medium heat for about 8-10 minutes, stirring occasionally. Cook the rhubarb until it has broken down to your desired consistency: the rhubarb will break down and become more "sauce-like" the longer you cook it. Meanwhile, chop the kale into bite sized pieces and put it into a salad bowl. I have also made this salad with pea shoots, which was also great, and I think any hearty, crunchy green would do well in this recipe. 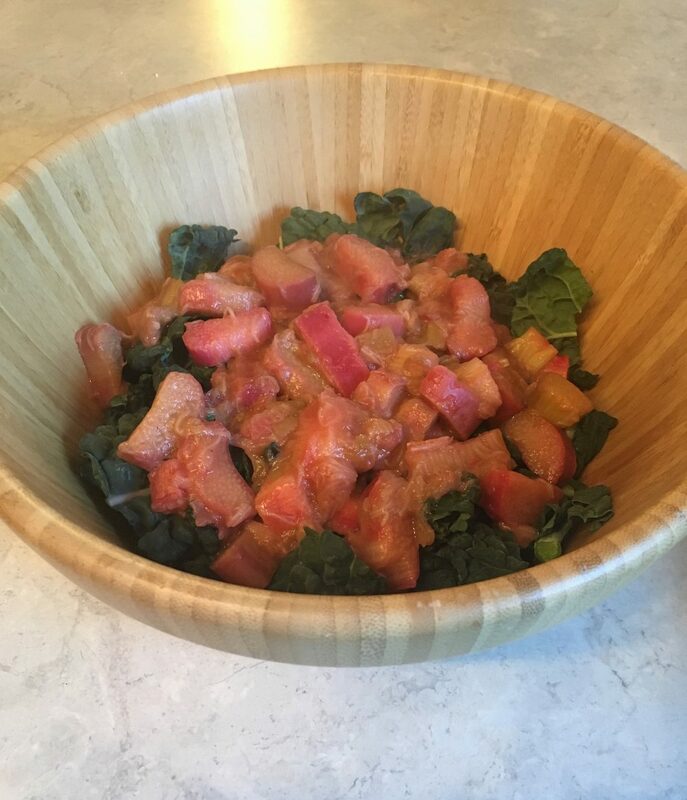 Once the rhubarb is done cooking, add it into the salad bowl, toss and serve. I like to add the sauce and serve right away - the hot rhubarb sauce makes for a bit of a wilted salad. If you prefer you can let it cool first to avoid wilting.